In the late afternoon of March 9, 1988, the Unit 2 boiling water reactor (BWR) at the LaSalle nuclear plant in Illinois was operating at approximately 84 percent of rated power (the point labeled with the green star on the Design Flow Control Line in Figure 1). A technician testing the instruments that monitor the water level in the reactor vessel opened the wrong valve, causing a false indication of high water level. This automatically shut down both of the recirculation pumps that pump water through the reactor. The loss of both recirculation pumps left the BWR operating on natural circulation of water through the reactor core. This caused the reactor power level to decrease, following the cyan line downward on Figure 1 to the purple star on the Natural Circulation Line at approximately 40 percent of rated power. Power is produced in BWRs by splitting atoms. When atoms spilt, heat is released as are subatomic particles called neutrons. These neutrons can interact with other atoms to cause them to split. The reactor power level in BWRs is primarily changed by two methods: (1) control rods and (2) recirculation water flow rate. Control rods contain material that acts like “neutron glue,” soaking up neutrons and preventing them from splitting more atoms. Inserting control rods into the reactor core reduces its power level while withdrawing control rods increases the power level. Recirculation pumps affect the power in a more complicated way. Increasing the amount of flow of water to the reactor vessel by the recirculation pumps increases the reactor power level, while decreasing the recirculation flow rate has the opposite effect. The reason is that water in BWRs moderates, or slows down, the neutrons released by splitting atoms. Slower neutrons are more likely to cause other fuel atoms to split and release energy. When both recirculation pumps shut down at LaSalle, the rate at which water flowed through the reactor core decreased significantly. This allowed more steam bubbles to form in the water flowing through the reactor core. As the volume of steam bubbles increased (i.e., the void fraction inside the reactor core increased), fewer neutrons were slowed down leading to a reduction in the number of split atoms, dropping the reactor power level. Following the rapid power reduction caused by the shut down of both recirculation pumps, the temperature of the water entering the reactor vessel dropped about 45°F over the next five minutes. As this temperature decreased, the water flowing through the reactor core became denser. The denser water slowed down more neutrons, causing more atoms to split and reactor power level to rise again. Approximately five and a half minutes after the recirculation pumps shut down, operators observed additional changes in the reactor power level. In particular, the reactor power level began oscillating by nearly 10 percent every two to three seconds. The operators recognized that they were in the region of reactor core instability (labeled Unacceptable Region of Operation in Figure 1). This region of high reactor power relative to water flow through the reactor core can be unstable due to steam bubble, or void, feedback. Power increases produce more steam bubbles. Steam bubbles fail to slow neutrons, which reduces the number of atoms spitting and thus reactor power level. The ensuing power reduction produces fewer steam bubbles, which increases the number of atoms splitting and thus reactor power. The loss of both recirculation pumps put LaSalle inside the region of reactor core instability The decreasing temperature of the water entering the reactor vessel increased the reactor power level, driving the plant farther into the Unacceptable Region of Operation. 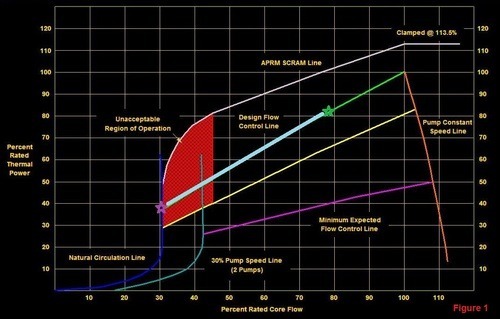 The operators attempted to restart a recirculation pump so as to leave the Unacceptable Region of Operation by retracing the path up and toward the right along the Design Flow Control Line on Figure 1. But they were not able to do so since they had not completed all the prerequisite steps, such as closing the pump’s discharge valve, necessary to restart the pump. 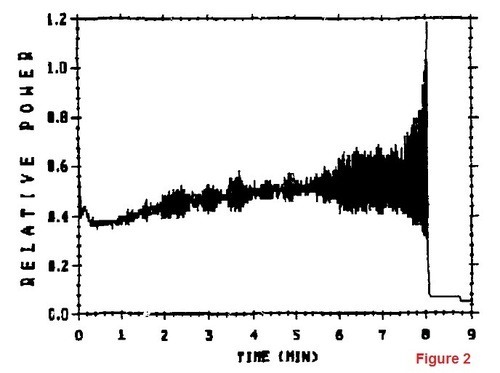 Figure 2 shows the actual power fluctuations experienced at LaSalle Unit 2 on March 9, 1988. Right after the recirculation pumps tripped, the reactor power level dropped to about 40 percent of rated. Over the next five minutes, the reactor power level gradually increased to about 50 percent power due to the feedwater temperature reduction. Beginning around five and a half minutes after the recirculation pump trip, the magnitude of the reactor power oscillations increased, meaning the peaks got higher and the valleys got lower. Roughly two and a half minutes later, one of the peaks exceeded 118 percent of rated power, triggering an automatic shut down of the reactor. Immediately reduce power by inserting control rods to or below the 80% rod line using the plant’s prescribed control rod shutdown insertion sequence. LaSalle’s owners received the warning from GE, but did not implement its precautionary steps. Two years later, the NRC weighed in on the matter. The NRC issued Generic Letter 86-02 to the owners of U.S. BWRs. The NRC concluded that the GE recommendations were sufficient to manage the reactor core instability risk. Perhaps, but only if actually implemented rather than placed in a file somewhere. LaSalle’s owners also received the reminder from NRC, but still did not implement the precautionary steps. Only after the LaSalle near-miss did the NRC take definitive steps to prevent yet another reactor core instability event. But they didn’t work. On December 23, 2004, the BWR at the Perry nuclear plant in Ohio found itself in the Unacceptable Region of Operation. Ignoring the oft-repeated instructions to immediately insert control rods to exit the region, the operators wasted time trying to fix the recirculation pump problem. But practice makes perfect. Two weeks later, the Perry BWR once again found itself in the Unacceptable Region of Operation. This time, the operators immediately inserted control rods to exit the region. One would risk the worst-ever case of carpal tunnel syndrome trying to type up all the times that safety problems at nuclear power plants were properly communicated from vendors or the NRC to other plant owners trusting them to take the steps necessary to avoid replicating the problems, only to have that trust misplaced when virtually the same problem recurred because the warnings were ignored. Lightning may strike but once, but stupidity strikes like a jackhammer. It is stupid for the NRC to continue trusting plant owners to heed warnings despite overwhelming evidence that warnings are all too often ignored. The NRC must periodically audit the warnings sent to plant owners to verify that safety recommendations are being implemented.